I don't give gifts because I want or expect gifts back, but other people's social guilt has delivered some excellent return or retaliation gifts. 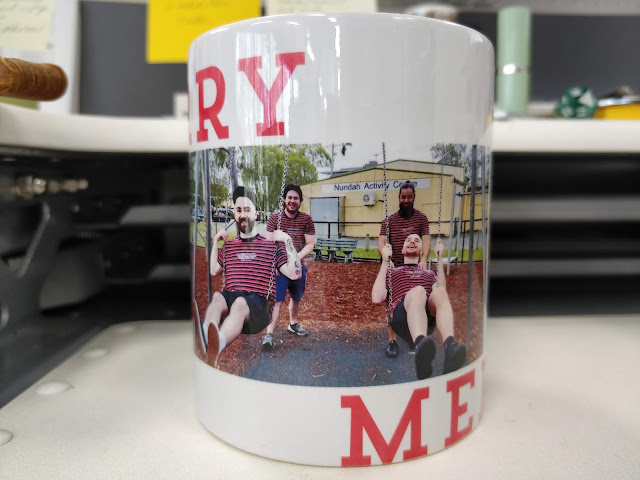 During our team break up lunch over Xmas, the Work Pham surprised me with two photo mugs. The sneaky bastards had gotten our social media gal to lie about taking behind the scenes pics for a story when she snapped us playing Uno on one of our daily brain-breaks. While I feel betrayed and will never trust anyone at work again, they couldn't have gotten a pod photo otherwise. The thought counts for something I suppose. The second mug is my favourite though. Instead of lying to my face, they hid behind my back. They waited until I was away from my desk and window that looked on onto the park so I wouldn't see them out there wearing matching outfits doing a photoshoot on the swings in the playground. The shoot went exceedingly well. Now, whenever I make a cup of tea or coffee, I see their gleeful faces smiling at me. It's going to be sad when we boot one of the guys out of our pod because my team's expanding. But at least I have something to remember him by. And also, I will see him over the divider.